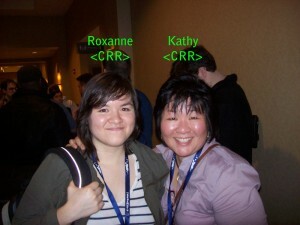 Roxanne and Kathy made it home from PAX East and they are BEAT. It was an amazing adventure of driving, navigating the streets of Boston, meeting so many other SWTOR fans, meeting the many amazing and gracious BioWare developers, community managers, etc. We got formal interviews with Daniel Erickson, James Ohlen, Hall Hood, and Cory Butler. We also taped some interviews with some terrific fans, some of whom spent the whole weekend standing in line to play SWTOR. We will be working hard to get all those up on the site as the week goes on. Dinner at The Barking Crab with Brooks, Zach, and Aennalissa. Beating the Taral V flashpoint, no deaths, first in our group to finish…the very next morning after being told that 90% of girl gamers are bad players. Zach and Dover tossing out inappropriate guild names. Musco acting out his Smuggler’s mincing little prance as he tried to find cover. Meeting the guys from Jen’Jidai. Daniel Erickson re-writing our Sith or Jedi test.